Like all my boards, this one came to me via Craigslist. Unlike the rest, this green 10-footer is a magic board. The 'magic board' is a special match-up between the traits of a surfboard and the style/strength of its surfer. Swaylocks is loaded with posts about magic boards. I found the ad on CL while I was travelling. A quick email and call to a friend arranged a pickup. J & J completed the transaction for me. They met the seller at his house in SF who told them that he had used the board for tandem surfing. He was leaving SF and didn't want to bring the board along. J & J squeezed it into their hatchback (somehow) and brought it over when I got back to town. The brand is SF, a small board-making operation and surfshop in San Francisco. 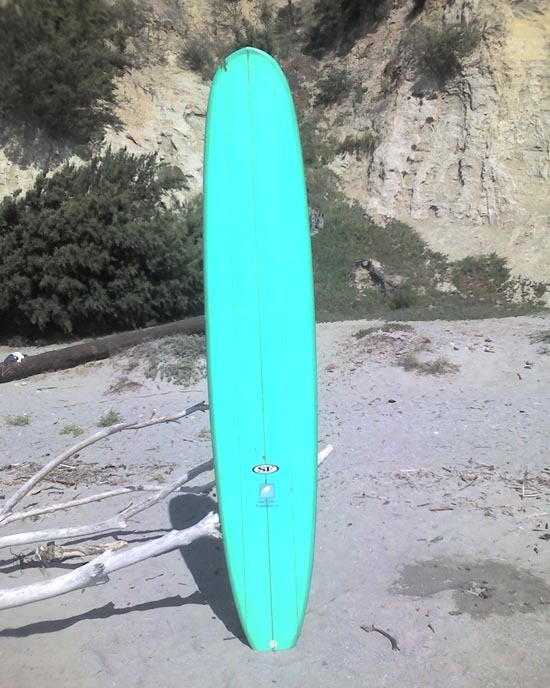 It's a sweet-looking board: Nice green tint, 10' x 23" x3.5", triple-stringer, big fin in the finbox. Big, round rails and lots of volume. Kinda heavy though: lots of glass. When it gets into a wave, it really screams down the line. I've taken it to Linda Mar on small days, Ocean Beach on big days: the board works amazingly well in all conditions. Magic. A few years back, I experienced a mishap. I paddled out at Linda Mar for a rare midweek after-work session. The waves had some energy and the paddle out took timing and paddle-energy. One incoming wave brought a surprising payload toward me: some hairy dude mis-timed his duck dive and ended up catching the wave backwards. 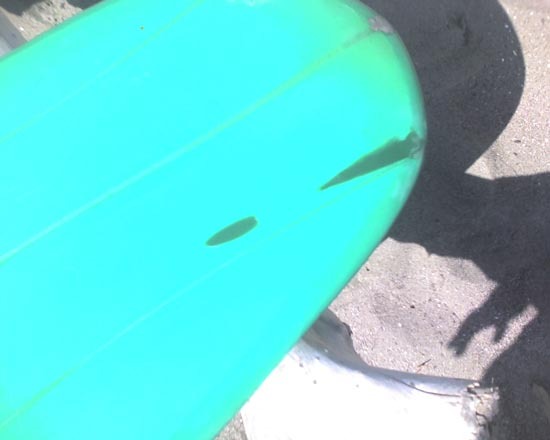 The dude's fin jammed into and cut through the nose of my board. 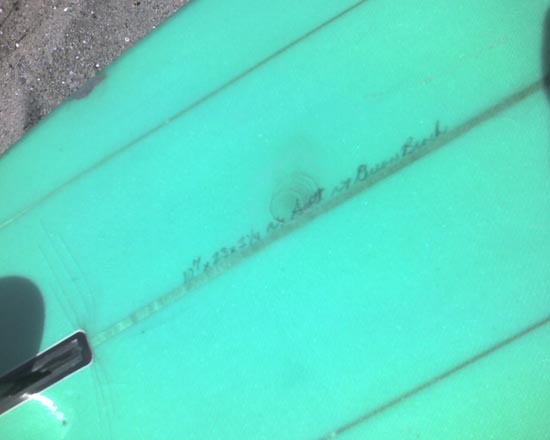 Sure, better the board than my shoulder or neck -- still I had a hole about 'that big' in my heart. Would this kill the magic? John: "Have you tried it in Bolinas? I made it for that wave." Me: "Why yes, I have. 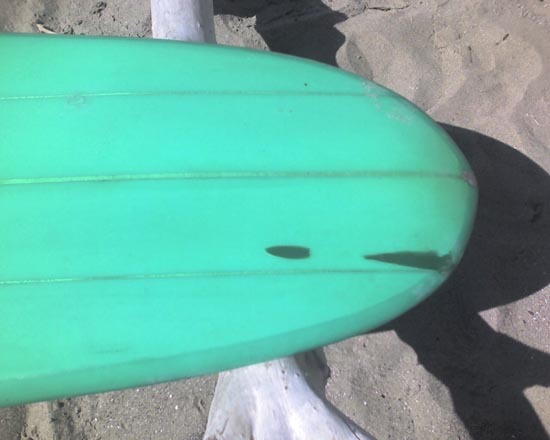 In fact this board seems to really sing on the waves at Bolinas. It's a perfect match." Me: "Can you make me an EXACT replica? 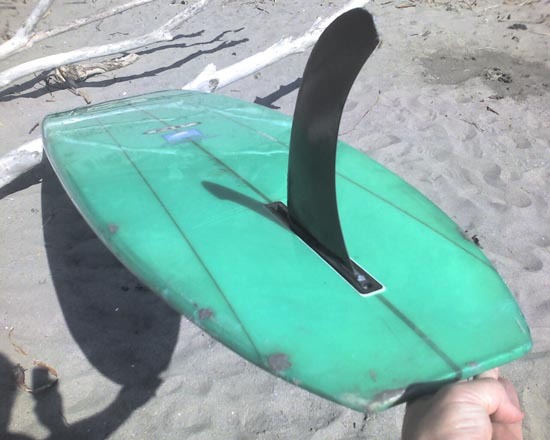 3-stringers, single-fin, resin tint? that and the magic. Don't leave out the magic. Oh yeah -- and a tail-block." John: "Nope. Can't work with giant blanks like that anymore." Me: gasp! "Then I better take care of this thing." Today, the board is mostly watertight. Lots of little dings and spider-cracks put this thing at risk for getting waterlogged and eventually destroying it (not to mention hairy dudes who can't duckdive). 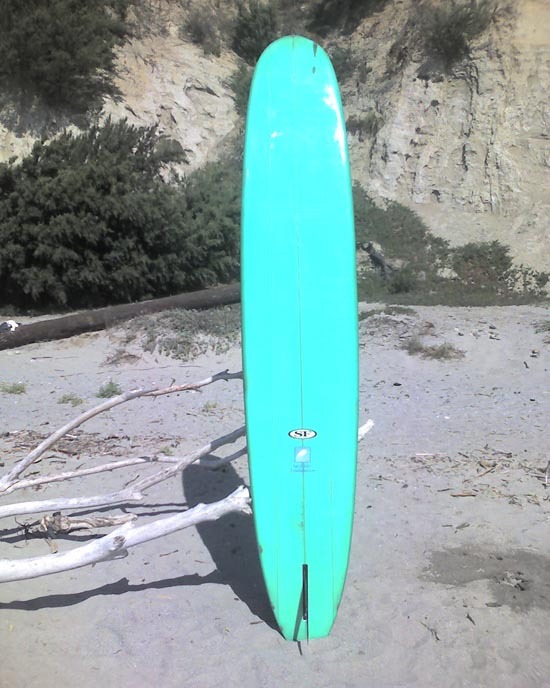 Each year around my birthday I wax this thing up and drag it up to Bolinas for some magic. I meant to post a rocker-shot too, I'll do this later. The deck has the dimensions and says 'For Scott at Ocean Beach'. Who is Scott? Why did he sell the board? What's he surfing now? Somehow it worked out. The people fell for it. Then someone said that the torch was heading up Townsend St. The crowded headed off the Embarcadero. Then someone said that the torch was being taken from McCovey Cove to the Ferry Building by boat, then a runner would run toward Bay St. The crowds turned and headed toward the Ferry Building. THEN it turns out that the torch was whisked toward Van Ness by bus. The runner jogged unnoticed into a convenience store, bought a pack of cigarettes and jogged on. All the protesters (and the unfortunate few who just wanted to see the torch) fell for it. Paige & David got all the good shots. How did the flashmob fail? Derek- Bakersfield -- makes me want to hop on the 99 and head south. Way to go! Ruby On Rails makes me want to get this java crap out of my life. I think the ROR folks will go nuts about this one. Seth: better or worse -- We were all singing along with this one at breakfast. Amazingly catchy. Peter: I haven't heard Discipline (I lack) yet. I like Malice and Caprice more with each listen. Bruce: Thoughts and Silence -- I haven't spun your tracks yet, but I'll send some notes when I get to it. 'been playing drums a night a week with some folks from meez. We have a few covers on the setlist at this point. Lots of originalz in the same vein... we'll play a show sometime in '08! Seeqpod is kinda cool, btw, check it out if you get a chance.